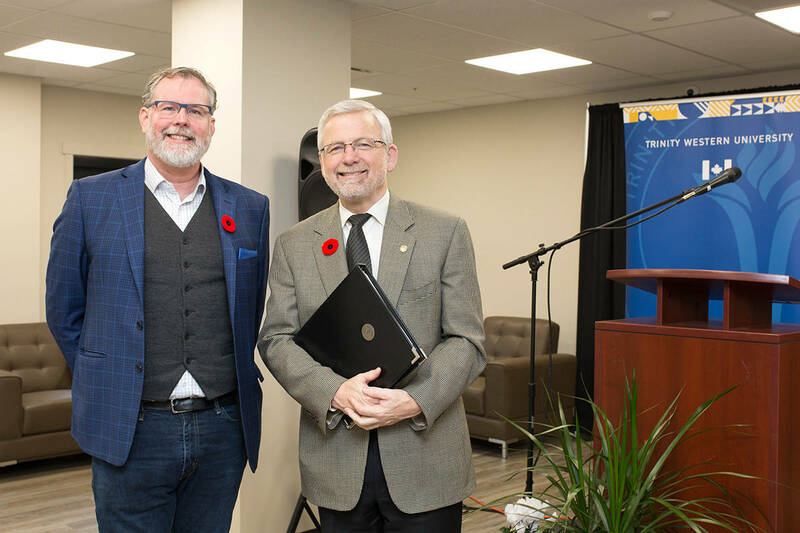 A just-opened new Trinity Western University (TWU) student residence is the first of its kind in Canada to use modular construction on such a large scale, the university said. It took just nine months to build Jacobson Hall, a five-storey, 220-bed student residence, which was officially dedicated on Nov. 2. Most of the construction of the new dorm took place indoors, in a climate-controlled factory that built the housing units, which were then trucked to the university campus to be assembled like giant Lego blocks using a large crane. Metric Modular, the Agassiz company that built the residence, has also built high-profile projects like the Whistler Athlete’s’s Village and the Elk Mountain Lodge Resort using similar methods. The new building will help TWU cope with increased enrolment that has left many students unable to find on-campus accommodation. In recent years, TWU’s 900 residence beds were usually filled, and some double-occupancy rooms were converted into triple-occupancy rooms to meet demand. Despite that, some upper-year students were still turned away from on-campus housing. In 2017-2018 the university opened Skidmore Hall, a smaller modular student residence that went up in four months. Built by ATCO, Skidmore accommodates 130 predominantly first-year students..
Construction of the newest residence was made possible by investments from key supporters including a significant financial lead-gift from the Jacobson family, the university said. TWU approached the Jacobson family to consider a naming opportunity in recognition of their years of contribution. Four generations of the family have been part of the University as founding donors, students, parents, alumni, board members and supporters.